We see it happen every year all across America. We sit down for a nice Thanksgiving meal, get full from turkey and stuffing, exchange a few jokes at the table, tell everyone what it is we're thankful for, and then less than 12 hours later we are rushing up and down the aisles of stores like madmen, frantically grabbing every doorbuster deal in sight. 'Tis the season for Black Friday, the most dangerous time of the year. Or should we say, Black-eye Friday, because yeah, things tend to get a little intense. 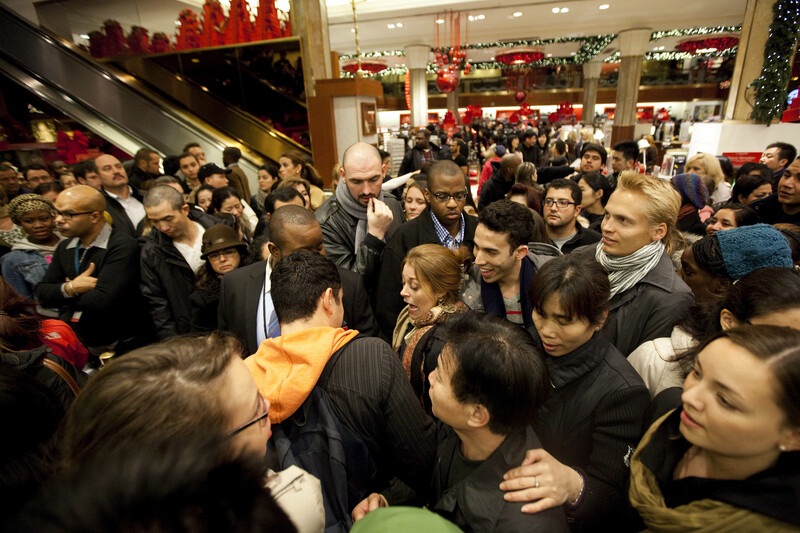 We've all seen the news stories about the ugly behavior that inevitably pops up on Black Friday. Customers get lost within the deals and discounts of the day, and nearly lose themselves. Stores get flooded with shoppers, and suddenly buying your nephew's ninja turtle action figure at 60 percent off turns into a near-death experience. Black Friday is notorious for being the most chaotic and stressful shopping day of the year, so this season, save yourself the hassle. While everyone else is out checking things off their Christmas lists, take the opportunity to keep your sanity intact — you still have plenty of time to shop before the holidays roll around. Here are 10 things that are way less stressful (and much, much safer) than shopping on Black Friday. If you haven't already pulled out your holiday decorations, Black Friday is a good time to stay in and decorate your Christmas tree with the family. You'll be happy you got it out of the way sooner rather than later. Get those holiday cards done early. Everyone loves getting snail mail, especially around this time of year. Sending anything within two weeks of Christmas is likely to lead to some serious delays, so it's good to get a head start now. Not that you need another excuse to get brunch, but while everyone else is out trying to get a bigger flat-screen TV, take the opportunity to snag a table at that restaurant you've been dying to check out. After feasting the night before, you're likely to have some pretty epic leftovers hanging around, and since the food is already made, why not get creative and heat up a masterpiece? Put together a turkey sandwich with cranberry sauce on a dinner roll. Or, if you really feel like getting up at the crack of dawn, use that time to do something that's actually productive, like making desserts that double as breakfast, because why not? Remember life before iPhones and Twitter? Give technology a break, and use the time to connect with others. After all, isn't that what the holidays are all about? So go pull out some of your favorite board games, grab some friends, and start rolling the dice. Why not get a head start on your New Year resolution? After all the stuffing you had the night before, it might be good to get the heart pumping. No one likes a crowded gym, so take advantage of the available space on Black Friday morning. With the holidays quickly approaching, it can be easy to put everything else on the back-burner. This might be the best time to finally get around to the DIY projects you actually want to make. All year long, you've been storing up unworn clothes and other things you have no use for anymore. So instead of going out to buy more stuff, use the time to do a little closet cleaning, and donate your used goods to the Salvation Army. For some, every night is a Netflix night. But for those of us less fortunate beings who have been getting behind on our favorite shows, we finally have a few days off to catch up. Stay indoors where it's safe and warm, and veg out to the show or movie of your choice. After a hearty meal the night before, it's natural to want to sleep in. And why shouldn't you? Let the crazies wake up at 3 a.m. to hit the mall while you unplug the alarm clock, pull down the shades, and catch some Zs. You deserve it!